This is Sony’s first Android smartphone after buying the shares owned by affiliates. How is the performance of Xperia series which is now labeled Sony without Ericsson again? The decision Sony to buy a fully trademark SonyEricsson by the end of 2011 ago not without reason. Now with a full label bearing the Sony, all the devices that they have can be interconnected in an “ecosystem”. An example is compatibility between Bravia HDTV with tablet computers. Or Playstation Network integration across multiple products. This features apply to their smartphones. 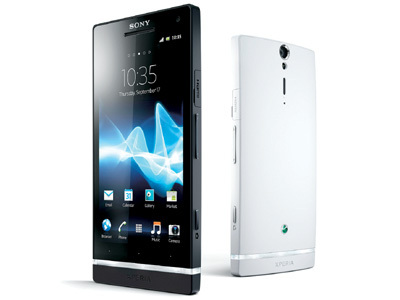 Xperia S series is the highest line of NXT Series Android smartphones Sony. This latest Xperia series promises a new and exciting experience, especially for fans of Android smartphones. The most striking of the three series Xperia S, P, and U is the transparent part at bottom of body. In addition to functioning as a sweetener look, it also be an soft keys indicator for navigating the process like back, home, and menu. However, note that part which respond to touch isn’t transparent bar, but three points above the soft keys image indicator. Smartphone design is fairly simple with minimal knickknacks including at the back of body. Xperia S body wrapped in matte instead of glossy material. The effect is your fingers trail will not be trace and plus the buttons are black so there was quite obscured. While on the front, in addition there is a 4.3-inch screen, there is also a front camera and a small LED indicator. 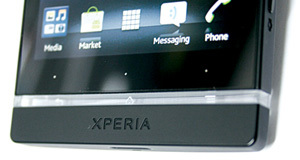 Xperia S Screen is one of the main attraction. The screen is capable to displaying 1280×720 HD resolution. That way, the smartphone has a very high pixel density (342 ppi) and even surpass Apple’s Retina Display iPhone 4S (330 ppi). Comes with Bravia Engine, enjoy multimedia content on Xperia’s screen was really fun when we play, including Full-HD video (which runs smoothly). Unlike other Android smartphones average “only” have a camera with resolution 8 MP, Xperia S capable capturing images with resolution 12 MP. Just like previous series, this product is also equipped with Exmor R sensor Sony’s typical that helps capture better images in twilight conditions. Not only that, there are also some interesting features such as Sweep Multi – Angle and 3D Sweep Panorama. Unfortunately, in order to enjoy the 3D Sweep Panorama maximum experience, you must connect it into 3DTV Bravia. Armed with a series of proprietary technologies, Sony embedding some of the best on this smartphone that can compete in the market. In addition, the unique design seems to be able to steal attention most of the smartphone enthusiast. Having a high specification for the dual-core processor class, Xperia S have performance that competes with Galaxy Note (though the Galaxy Note work slower 100 MHz). Overall Xperia S easily run any applications smoothly. 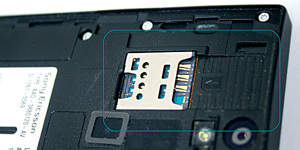 Xperia S uses a micro-SIM like the iPhone 4/4S and Nokia Lumia. There are micro-HDMI port for display smartphones in HDTV. Minus: Using a micro-SIM, without micro-SD slot.